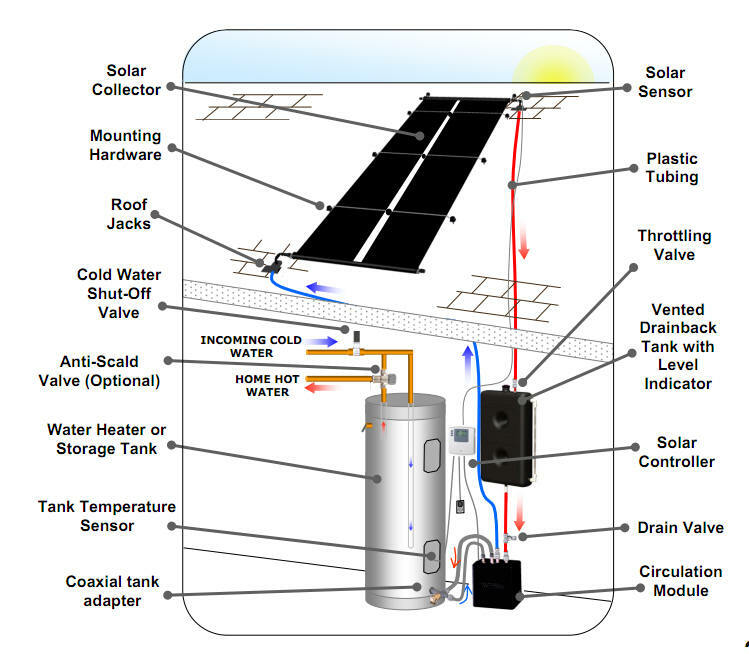 The Sungrabber is an interesting newish commercial solar water heating system that makes use of unglazed plastic collectors (pool heating style collectors) rather than the traditional glazed flat plate collectors -- this allows a substantial reduction in the system price. Just to give an idea of the potential, unglazed plastic collectors sell for about $5 per sqft while traditional glazed flat plate collectors are about $30 a sqft. The collectors are unglazed plastic pool heating style collectors. The system is a drain back system, meaning that when the sun goes off the collector, and the pump turns off, all of the fluid in the collector drains back to the drain back tank -- this is a well established method of providing freeze protection and works well even in the coldest climates. It also means that plain water can be circulated through the collectors, and the hassles of dealing with antifreeze are avoided. To transfer the collected heat from the collector loop to the hot water tank, the collector heated water and the water tank water are circulated through a heat exchanger in the the "Circulation Module". Of course, with unglazed collectors, performance will suffer dramatically in colder climates -- the link below gives a rough estimate on how much. 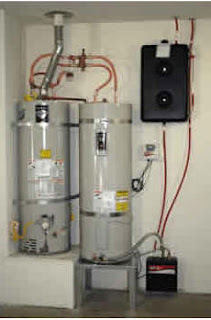 But, the system price is much lower, and in spite of the hit in cold weather performance, in many climates the payback period will be substantially less than for a conventional $8000 commercially installed solar water heating system. It seems to me that the solar water heating industry has been in a bit of a rut (an expensive rut) for some time, and this kind of system shows some good innovation -- it would be nice to see more of this. This would make an ideal DIY solar water heating system, as it looks to be relatively straight forward to install. I don't know if Sungrabber offers it this way or not. There are some other interesting DIY versions of the system. For example, the regular $1K DIY drain back system could be set up with the same kind of unglazed plastic mat collectors. This would significantly reduce the work involved, and it would result in a system that was somewhat more efficient than the regular Sungrabber system as the storage and collector area could both be pushed up some with very little cost increase. In an interesting twist, I believe that if one used an SRCC OG100 certified unglazed collector (of which there are many), the full cost of the $1K system would qualify for the 30% federal rebate! This would get the payback down to less than 2 years for many people. State rebates might further decrease the cost getting it down near the zero area in some places. Of course it will perform much better but cost more. Also, it is freeze tolerant, which suggests some other cost saving strategies, like eliminate the heat exchanger? Hi Kevin -- That's a pretty impressive collector. Will try to get more info on it. I wondered about using the sungrabber collectors and installing them with glaze, building a box similar to the copper tube/fin diy system. The collectors themselves are only $3.62 with shipping. What would be the anticipated benefits/pitfalls to this putting them together? It looks like the total price would be around $5 sq ft but qualiffy for the rebate.